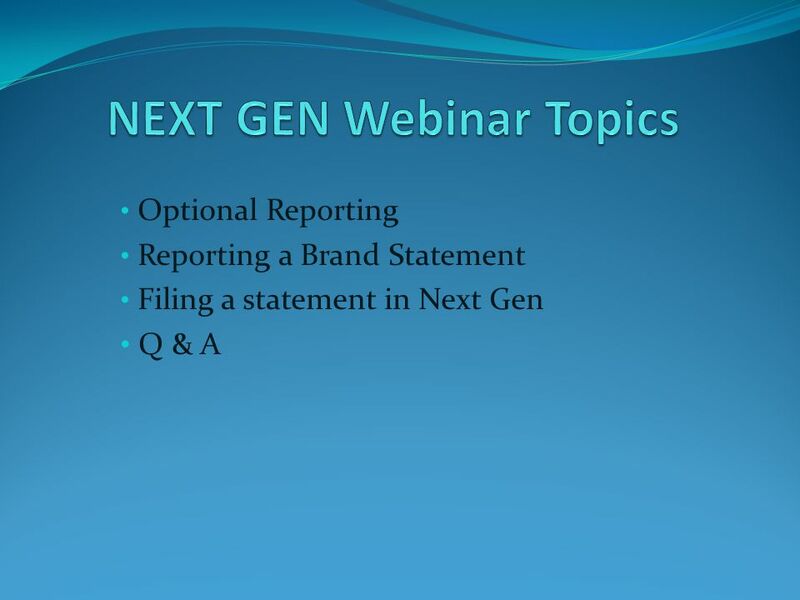 Optional Reporting Reporting a Brand Statement Filing a statement in Next Gen Q & A. 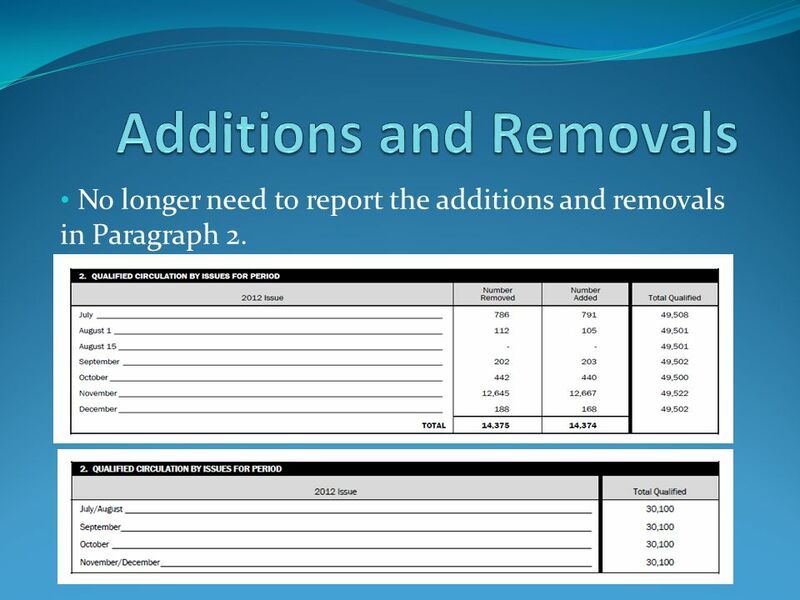 3 No longer need to report the additions and removals in Paragraph 2. 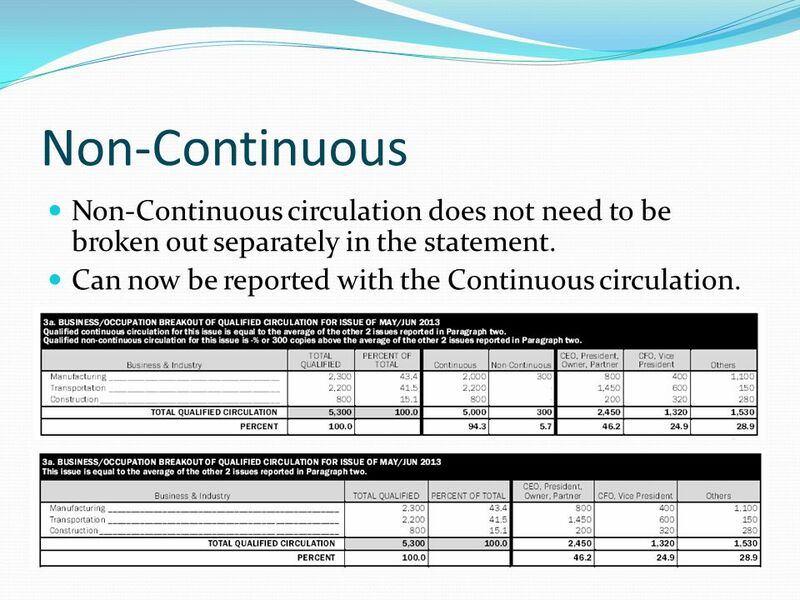 4 Non-Continuous Non-Continuous circulation does not need to be broken out separately in the statement. Can now be reported with the Continuous circulation. 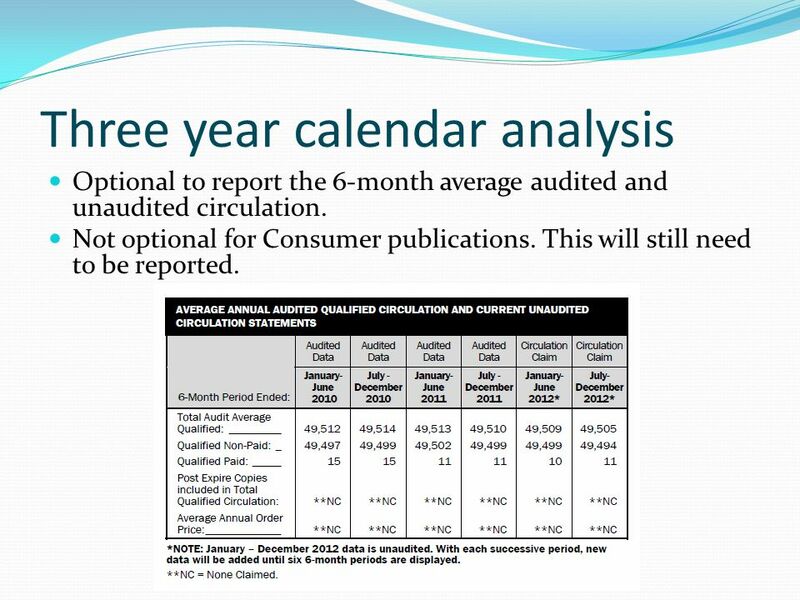 11 Three year calendar analysis Optional to report the 6-month average audited and unaudited circulation. Not optional for Consumer publications. This will still need to be reported. 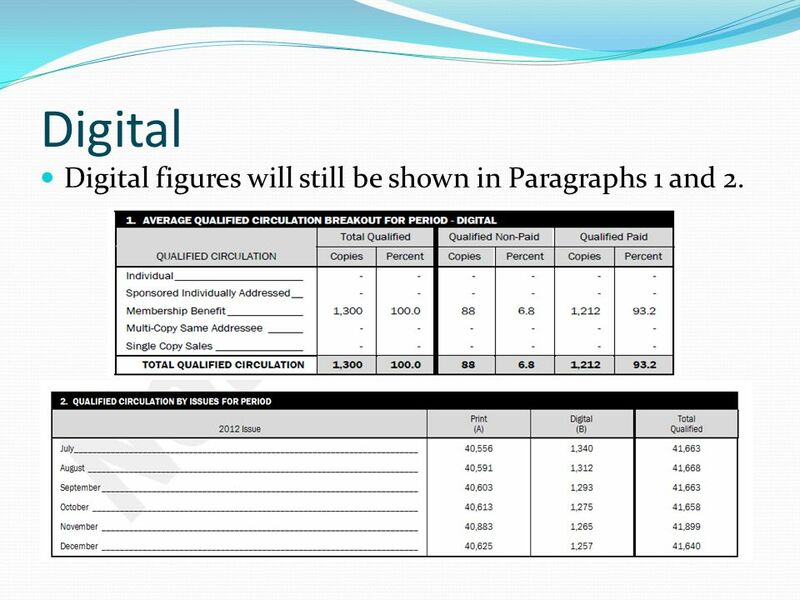 12 Digital Digital figures will still be shown in Paragraphs 1 and 2. 13 Digital The remaining paragraphs are optional to report Digital. (P3a- 4 or P3-P5). 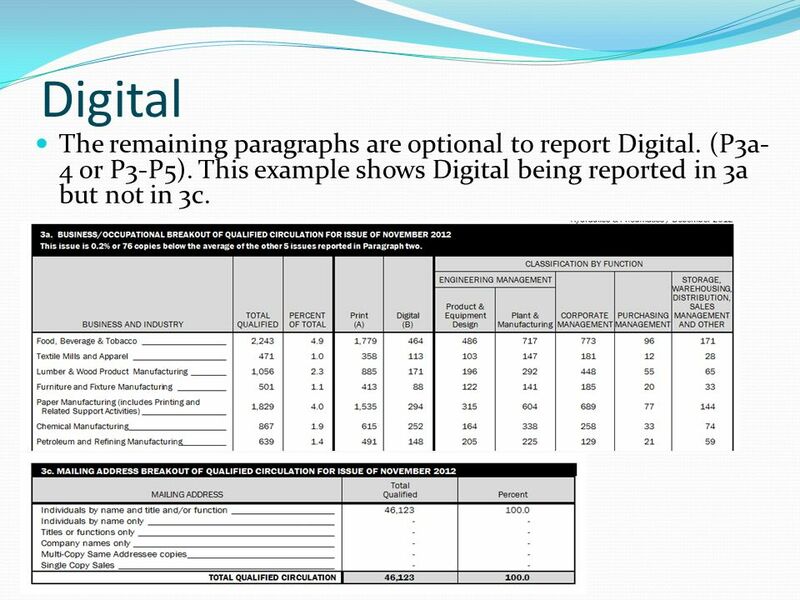 This example shows Digital being reported in 3a but not in 3c. 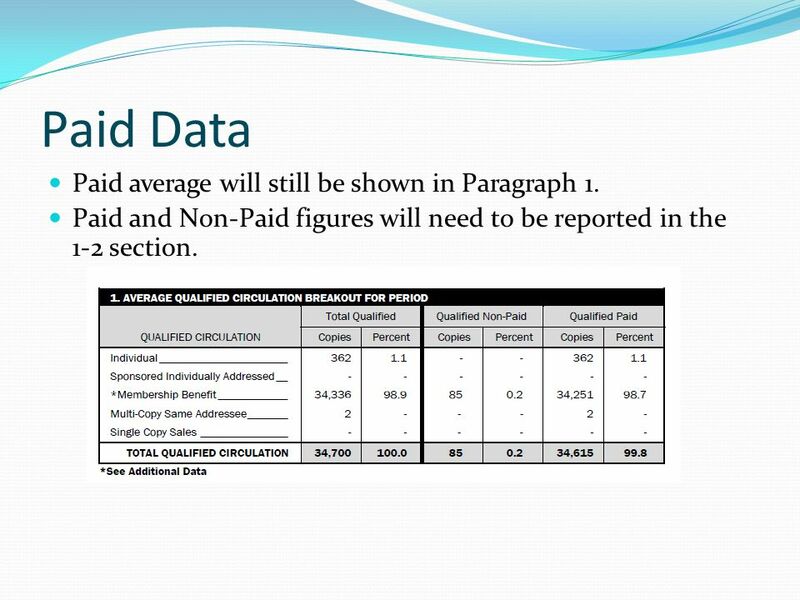 14 Paid Data Paid average will still be shown in Paragraph 1. 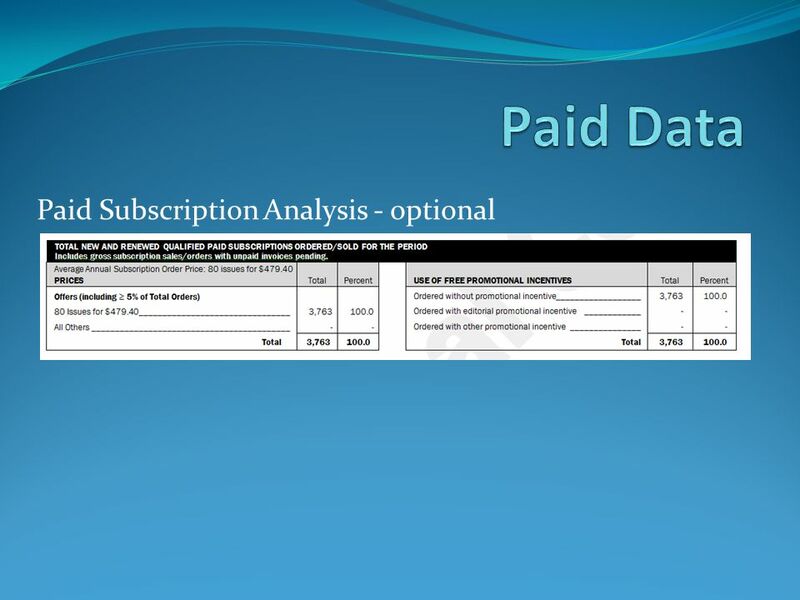 Paid and Non-Paid figures will need to be reported in the 1-2 section. 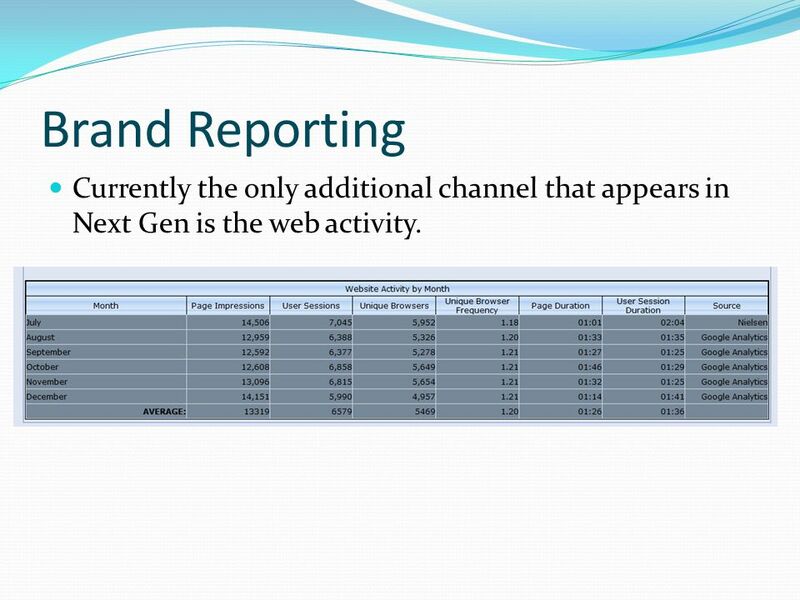 17 Brand Reporting Currently the only additional channel that appears in Next Gen is the web activity. 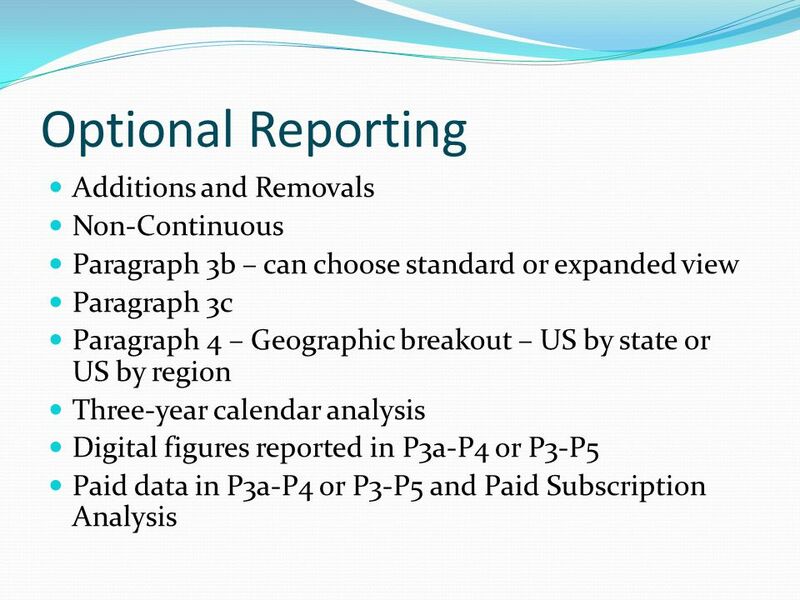 18 Brand Reporting All other channels will need to be filed through an excel template. e-Newsletter, webinar, social media, apps, events, white paper. 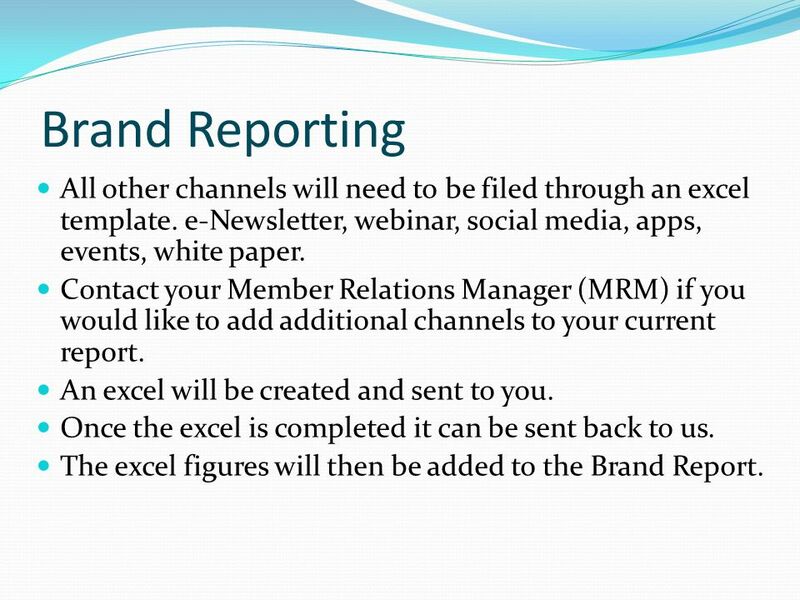 Contact your Member Relations Manager (MRM) if you would like to add additional channels to your current report. 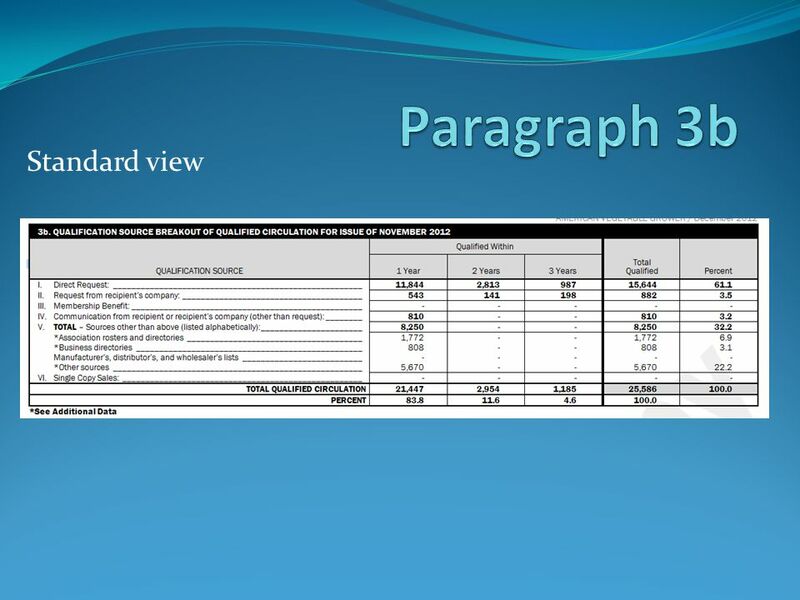 An excel will be created and sent to you. 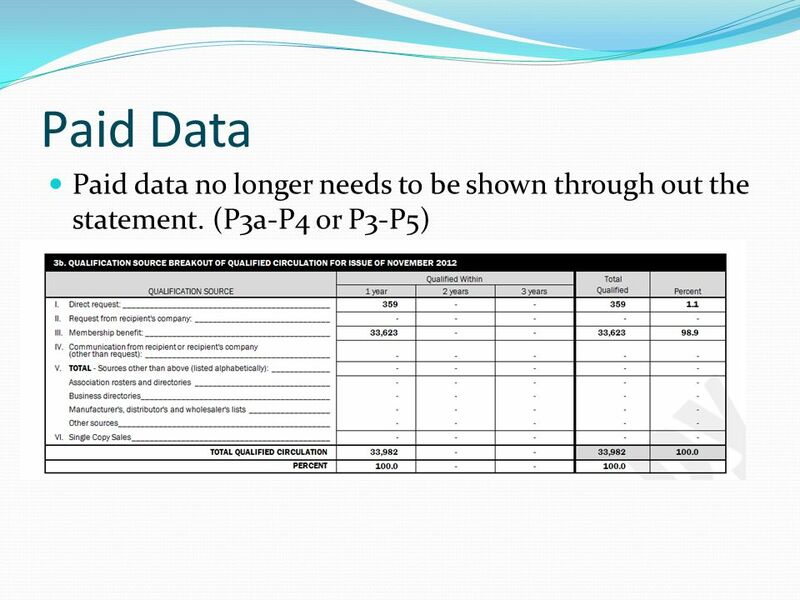 Once the excel is completed it can be sent back to us. 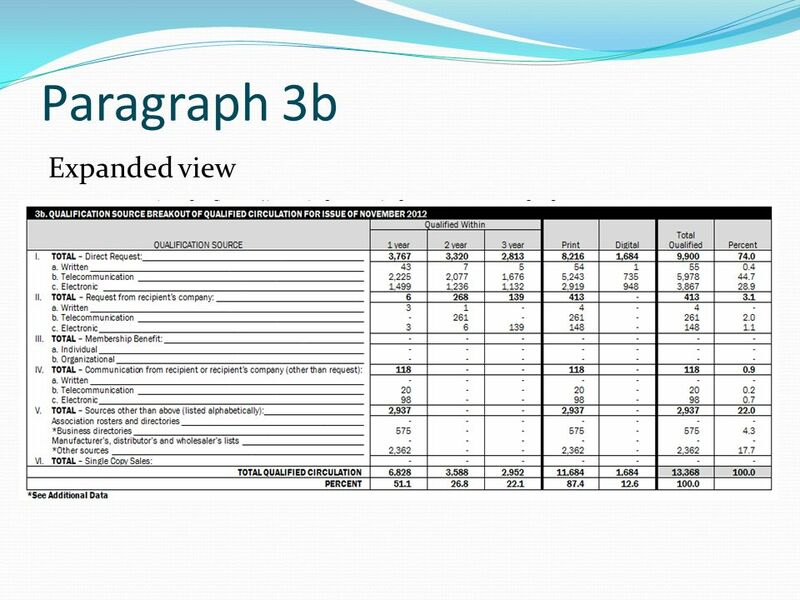 The excel figures will then be added to the Brand Report. 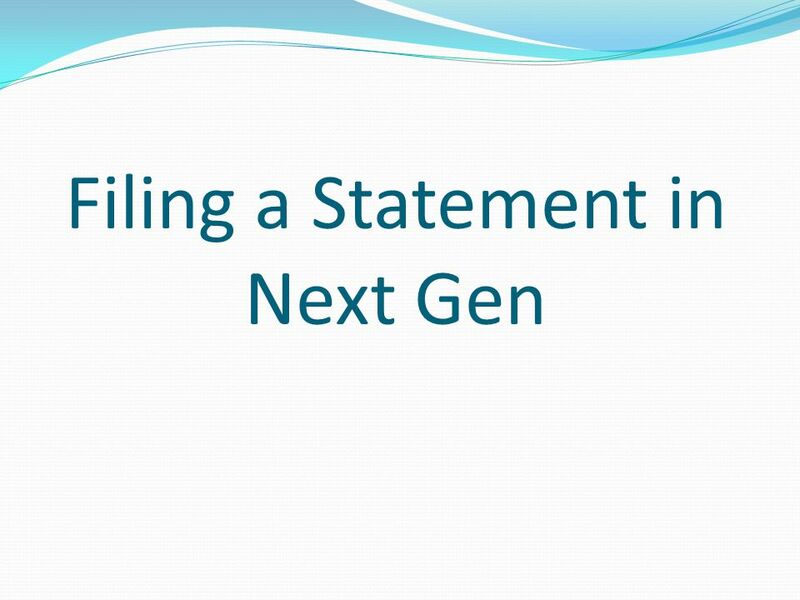 Download ppt "Optional Reporting Reporting a Brand Statement Filing a statement in Next Gen Q & A." Web Center Certification Administration Web Center Certification Training Intuit Financial Services University. 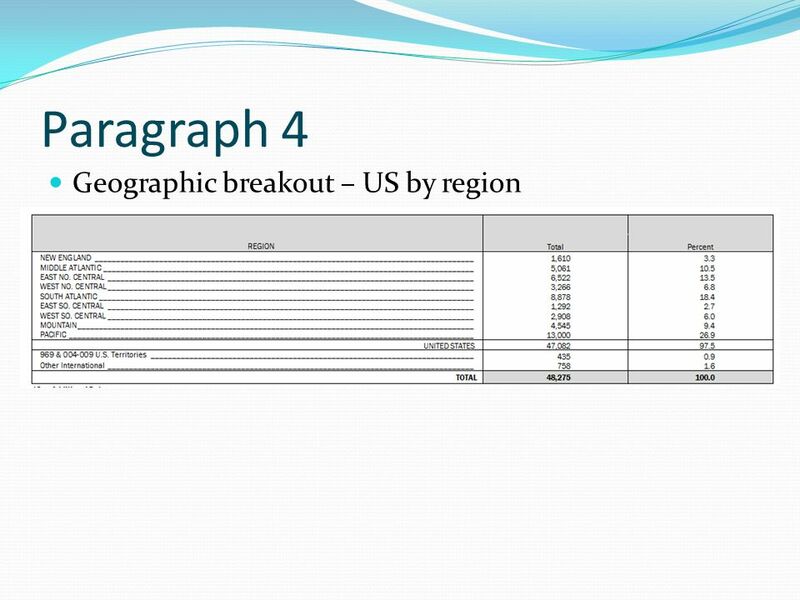 IP Warming Overview and Implementation Using Eloqua. Setting up an E-XL A Step by Step Tutorial Engineering Consultants Group, Inc. 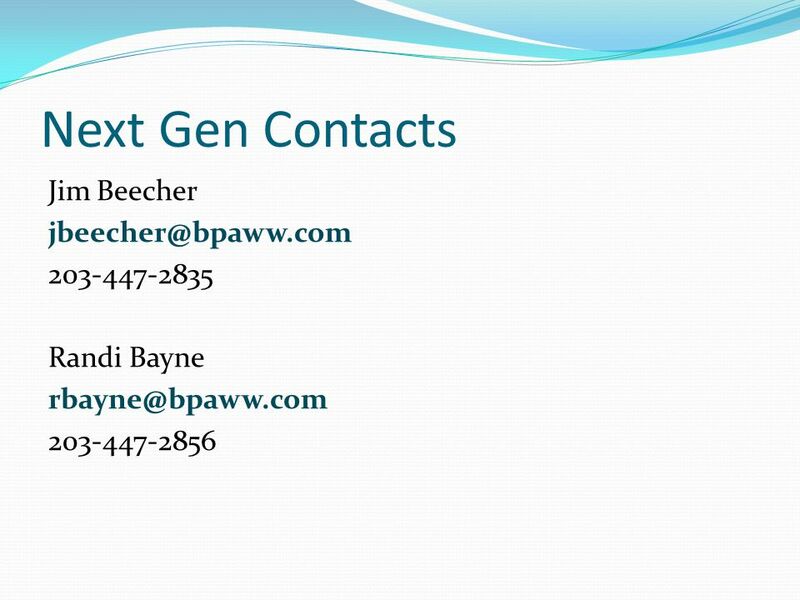 Web Page Training Summer 2014 Presented by: Mountain Brook Schools Tech Team. IEEE e-Notice IEEE Region 4 Meeting Jan 31 – Feb 1, 2004 Presenter: Bob Evanich, R4 Communications Chair. 2013 Texas Ad Astra Summit Monday, July 22 nd What’s New in 7.5 for Event Scheduling Presented by: Kelly Hollowell, Manager of Education, Ad Astra. INTRODUCING A NEW COMPONENT FOR TODAY’S INTEGRATED MARKETING. 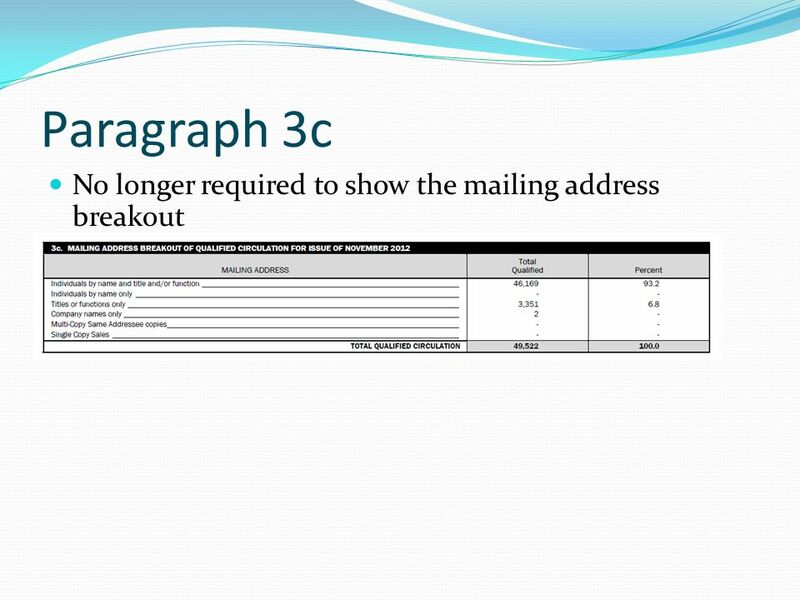 Overview Scheduler 1.Tx Plan – Special Considerations – Copy when copying to a new Tx Plan 2.Patient comments extended to 7000 characters 3.Alerting change. CE4 to CE6 The “New Look” Overview. Your course will be migrated from CE4 to CE6 for you. 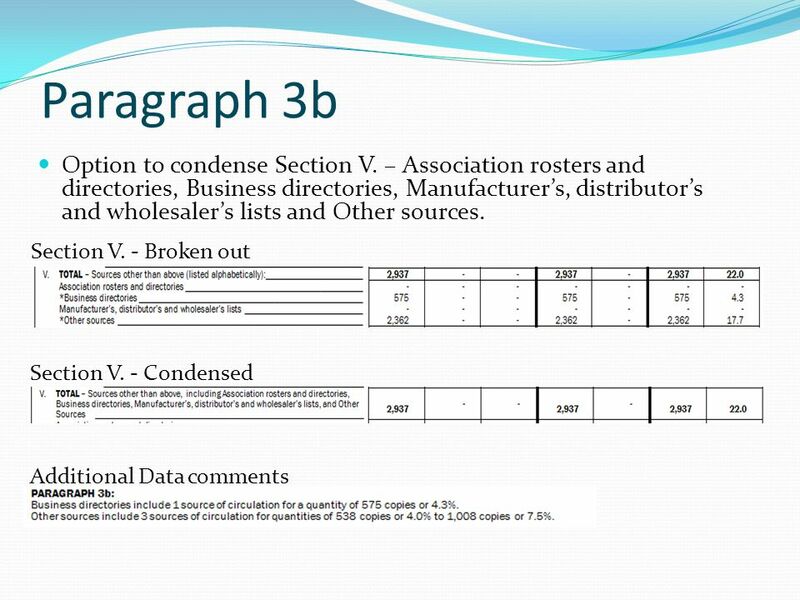 Your CE6 course will contain all the items that were present. 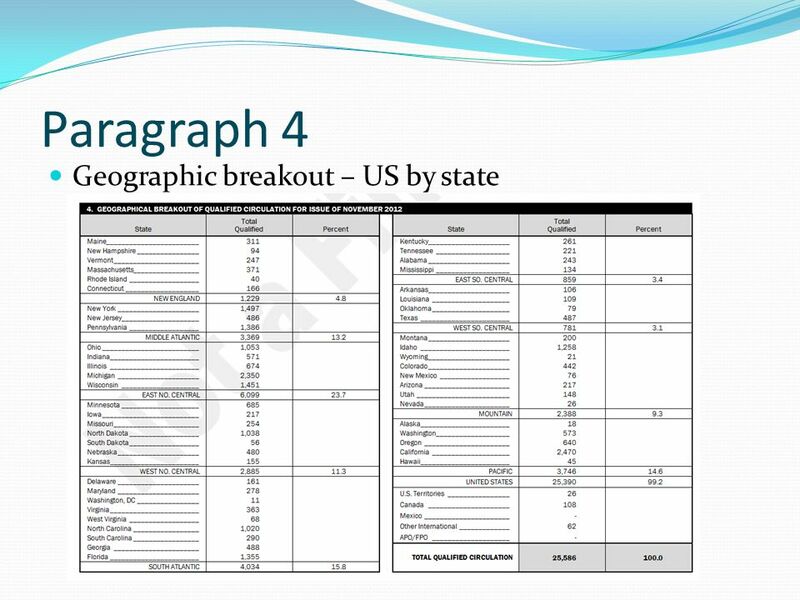 Marketing PE: Understand the use of direct marketing to attract attention and to build brand. PI: Explain the nature of marketing tactics. A – Promotion Marketing PE: Understand the use of direct marketing to attract attention and to build brand. PI: Explain the nature of marketing. COMPLIANCE & AWARDS MATRIX Robin Fenton, SCTE, Director of Chapter Support.